WE JUST UPLOADED THE ONLINE SHOP WITH HUNDREDS OF NEW ITEMS ! 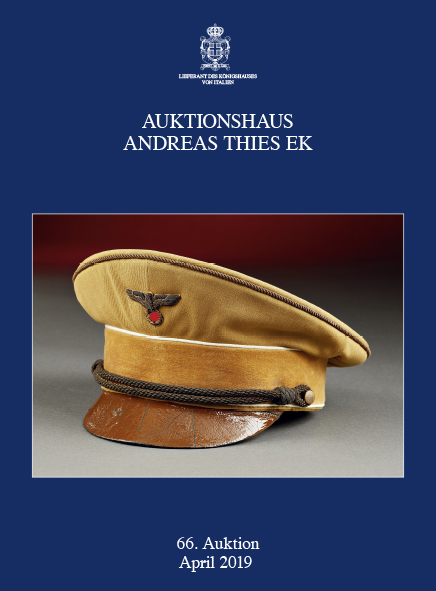 The announcement of the sale of the highly important and truely magnificent grouping of Adolf Hitler and Eva Braun personal memorabilia, important furniture and works of art as well as important documents, including one of only very few absolutely authentic and extensively documented original personal visor hats of Adolf Hitler, has created an unprecedented amount of interest from leading private collectors, museums and institutions around the world. We have therefore decided to offer these museum quality items in a specially printed high end catalog. Due to their importance these items have been stored in the vaults of an international freeport and can be viewed by appointment only. The auction sale will be held in April, 2019 on international territory. The documentation of this museum quality grouping goes back to 1945 - a unique opportunity for museums and important private collections to aquire one of the most important pieces of WWII Memorabilia still in existence today! This is the highest result for any WWII collectible ever achieved at auction. Our December 14, 2018 sale also achieved remarkable results (the complete prices realized see on left hand side topic "Ergebnislisten". Appart from these Highlighs many quality items in the 3 and 4 - digit price range also were sold for very good results. Appart from many top quality items we will offer in auction 67 (summer /autumn 2019) a large selection of approximatelly 1000 lot numbers of quality items for every budget. 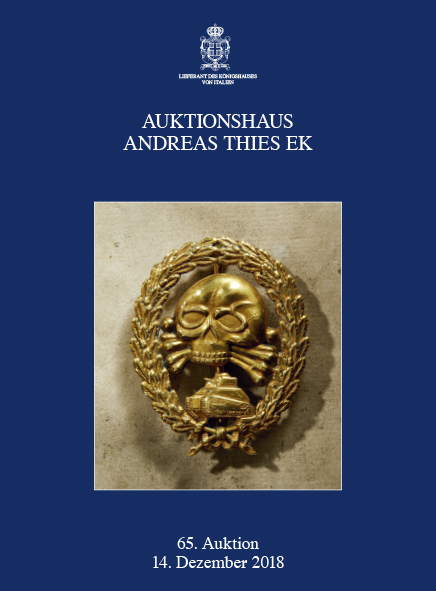 This includes the last Part of the important Collection "Alte Armee und Deutsche Wehrmacht" with many items from veterans of the 8th Panzer - Division. 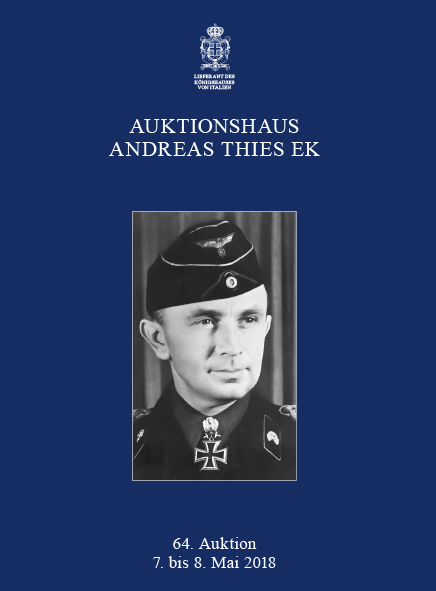 This sale will also feature Part II of the Lothar Hartung - Collection, one of the largest and finest Collections on Hitler Youth, DJ, BDM, JM and NPEA ever offered at auction. The former HJ - Museum - Collection was assembled over a period of more than 40 years and is arguably the best of it's kind in existence. We are also currently planning an important gun sale with a magnificent collection of German Military Firearms from 1850 - 1945. Online Shop Update - Der Shop wird regelmäßig erweitert. The Online Shop will be updated regularily. Die nächste Auktion historischer Feuerwaffen ist für Frühjahr / Sommer 2019 geplant. Wir versteigern eine der bedeutendsten Sammlungen deutscher militärischer Ordonnanzwaffen 1850-1945. Die alten Kataloge vergangener Auktionen finden Sie unter "Kataloge Saalauktion" - To browse through our past sale catalogs go to "Kataloge Saalauktion". We have uploaded a picture preview for you which will be regularily updated at: Bildergallerie kommende Auktionen, left hand side. If you do not have access please register at www.andreas-thies.de (registration for new customers). We will verify your registration and send you a personal password. Should you have any questions, or need assistance placing bids, please email us at thiesauctions@gmail.com or call 540-424-1338.